Do you like eggs? I like eggs. I went searching for a **really good egg** and wrote about my quest/obsession in Post Defiance. Since PD is working on a relaunch, and the story is unavailable, I’ve re-printed the article here (super-long, especially without the accompanying photos), just in case you’re on an egg hunt of your own. I like eggs. I particularly like eggs that perform well in the frying pan and then taste great on buttered toast without a lot of additional seasoning. But in the egg aisle at the supermarket, there are so many options that it’s difficult to discern which dozen will meet my requirements. The labeling on the cartons is bewildering. How can products that appear to be identical vary so greatly in price? And how is the average consumer, who just wants to go home and make an omelet, supposed to determine which eggs are the best? I understand that “cage-free” may not necessarily mean “free-to-leave-the-building-and-experience-the-world-of-sunshine-and-grass-and-tasty-bugs.” But wouldn’t you expect “free-range” and “pasture-raised” to meet that standard? Though the USDA doesn’t offer a definition for pasture-raised, they define free-range as “animals that have access to outdoors,” even if the access only leads to a small slab of concrete. To get to the bottom of this egg-labeling dilemma, I purchase lots and lots of eggs—both from grocery stores and farmers markets—and prepare to conduct some quasi-scientific experiments. And yolk color—despite our cultural association with yellow yolks—doesn’t significantly reflect the nutritional value of the egg either. Yolk color is determined by the hen’s diet. For instance, if she eats white corn her yolk will be lighter in color. So I begin by checking eggs for freshness using the float test. While eggs vary in freshness within each carton, the freshest eggs come from local farms and are more likely to display signs of sinking. Next, I perform blind taste tests with fried eggs. There’s quite a bit of variability from brand to brand, even when they have similar labeling. The nest-laid and free-range are okay, but pasture-raised eggs seem to be a notch nicer, and those from the farmers market taste superior to the typical grocery store varieties. But even among pasture-raised eggs from the farmers market, it seems that not all eggs are created equal. I find that I prefer the flavor of certain local, organic, pasture-raised eggs. To me, these eggs taste rich and creamy. I can close my eyes and imagine the idyllic pastoral setting where chickens do henny things…scratch and peck at weeds and grass seeds…catch and eat bugs and worms…preen, take dust baths, and socialize in relatively un-crowded, stress-free conditions. Healthy and happy hens who are able to channel their energy into producing nutritious (and delicious) eggs. At GardenSphere, potential backyard poultry farmers can learn all about building coops and raising chickens. I admit the idea intrigues me. As an urban chicken farmer, you can ensure that your hens lead a happy, healthy life, producing top-notch eggs in their very own Cluckingham Palace. But pet hens typically live 5-8 years (one Methuselah wanna-be reportedly lived over 22 years) while their egg productivity, depending on breed, declines dramatically after just a few years. So unless you’re planning to put Miss Henrietta and the Dixie Chicks in the stew, keep in mind that eggs are merely a side benefit of hen husbandry that dwindles over time. Yet, as any chicken enthusiast can attest, domestic chickens (Gallus gallus domesticus) are really interesting animals. And, they’re also kind of weird. For instance, the inclination of hens to lay eggs year-round whether or not a rooster is present is definitely weird. Think about it. Egg production requires a huge investment of energy. In the wild, if a bird expends that much effort, it needs those eggs to be fertilized and to hatch chicks that will eventually leave the nest to perpetuate the species. So, as the mid-15th century BC Egyptians put it, the “bird that gives birth every day” is highly unusual—much to the benefit of egg-loving humans. One of chickens’ interesting natural behaviors that is less convenient for humans is their annual molt. As winter approaches and the days shorten, the hens’ hormones trigger them to molt—to shed and regrow their feathers—during which time they shift all of their egg-laying energy into feather production. Molting results in weeks or months of no- or low-egg production. You say you haven’t noticed that eggs are less plentiful in the grocery store during the winter? That you aren’t aware of eggs ever being “out of season?” That’s because of methods that commercial poultry farmers use to deal with the molt. Those aren’t pet hens. And molting impacts profitability. If farmers allow their hens to molt naturally—to accept that molting is just part of a happy, healthy hen’s natural life cycle—and continue to feed them despite the fact that they aren’t necessarily earning their keep, any eggs from those hens will be more costly to bring to market. Makes total sense, right? Apparently, the margins are pretty tight on eggs. Even large producers—who benefit from economy of scale and greater purchasing power—regularly go out of business because it’s too difficult to turn a profit. To minimize the decline in revenue, farmers may choose to control the timing of the molt—so that some portion of their flock is always laying. One method of control is to artificially extend the daylight—and the laying period—using lamps to light the barn and tricking the hens into thinking it’s still summer. Another method is to stress the hens, forcing a molt by withholding food for 7-14 days. After the molt occurs, the hens return to higher levels of productivity. Some farmers prefer to avoid the molting process entirely. They cull the flock and sell it for meat when productivity declines. Remember, this is intended to be a for-profit agricultural endeavor. Even if commercially-raised hens go through a season or two of molting, their egg-productivity will wane. The cost of feeding the hens will eclipse the profit made from selling their eggs and the hens will be culled to make way for a new flock. Compared to chickens raised for meat—slaughtered between 5 and 9 weeks from hatching—52-156 weeks is a relatively long life. But back to my quest. Early Bird Farm eggs were among those I’d experimented with and are already the lead contender for adorning my toast. Meeting “my” hens might be the deciding factor. Although it’s a busy time on the farm, Rawley promptly invites me to visit—as long as I agree to wear muck boots and chat while he works. And work he does. It’s easy to see why you have to love what you’re doing to succeed at farming. It’s an amazing amount of work. One of Rawley’s goals is to raise chickens that produce “a really good egg.” But Early Bird Farm isn’t just for the birds. Rawley is passionate about running a sustainable farm—offering a wide variety of fresh, local, organic, seasonal produce. As we tromp out to the pasture where the chickens live, Rawley points out the heritage tomatoes he’s just planted, steps over the curved frame of the new green house that is going up soon, and talks excitedly about the radishes, greens, and other vegetables he brings to the farmers market each week. As we approach the pen (electrified fencing keeps coyotes out and chickens in), the excitement of the flock is palpable. They are keenly aware that Rawley often brings snacks to supplement their foraging. Sometimes the snack is high-quality feed; sometimes it’s vegetables from Rawley’s organic gardens. Either way, it helps to distract these curious, alert birds while he collects their eggs. The chickens are outdoors all year, but with good access to shelter. Rawley rotates the pen and coop around the field to provide fresh grazing once the chickens have cleared—and helpfully fertilized—each section of ground. His hens appear to be living full, happy lives with a minimum of stress. 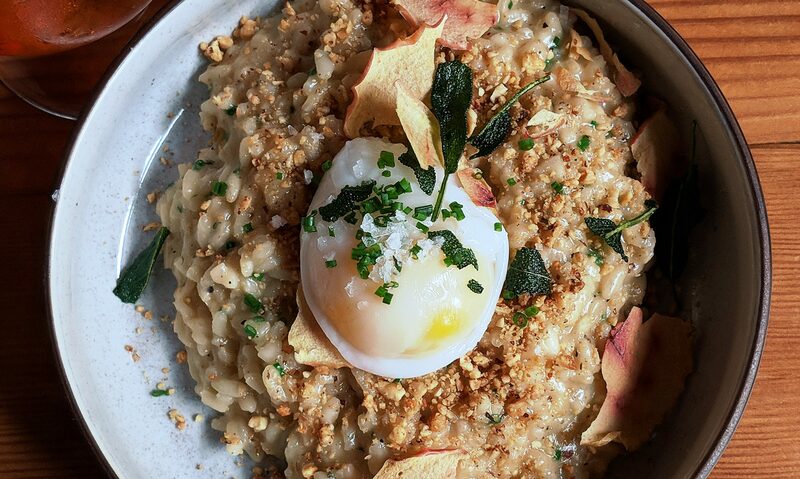 Combined with a well-rounded, healthy diet, they produce nutritious and delicious eggs that were featured atop Bon Appetit’s 2013 Dish of the Year, created by Seattle restaurant The Whale Wins. During the winter, Rawley’s hens molt on their own schedules and lay only 20% of what they produce in the high season. But by nurturing the hens and allowing them time to rest and recuperate, Rawley is also ensuring that come spring, the happy healthy lifestyle his hens enjoy will be translated into another season’s worth of delicious, nutritious eggs. And it was clear to me why I preferred the taste of these eggs. Not only are they are a completely different product from what you find at a typical supermarket, they’re also among the best at the farmers markets. At Early Bird Farm, I’d found my ideal—a really good egg.